Higgins boats delivered troops and vehicles to the beaches of Normandy. 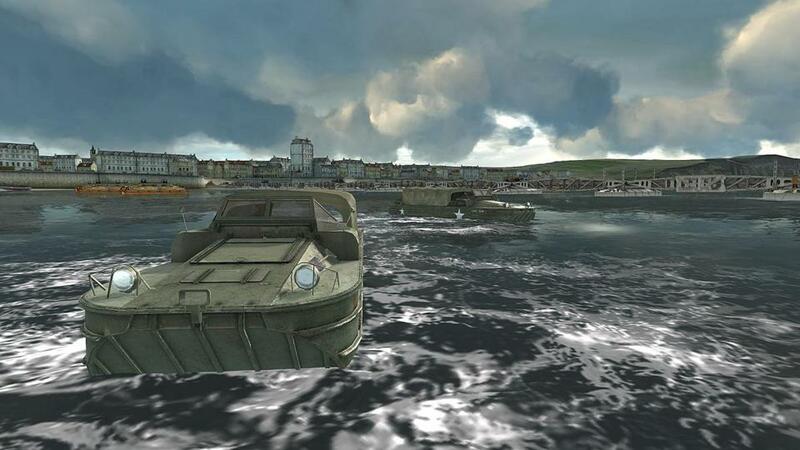 Seventy years after American, British, and Canadian troops stormed onto the beaches of Normandy, a new generation of scientists are digitally recreating the machines that got them there. Among the show’s highlights: three-dimensional simulations of the landing craft that brought troops ashore, the gliders that dropped American commandos deep inside Nazi-occupied France, and a pair of vast portable harbors used to unload thousands of tons of supplies onto the beaches. “I thought it was astonishing. It really was like stepping back in time,” said marine engineer Tim Beckett, son of the designer of the so-called Mulberry Harbor, Allan Beckett, after surveying a Dassault simulation of his father’s handiwork. Manufacturers use Dassault simulation software to design products on a computer, before assembling them in factories. Boeing Co. uses Dassault software to design its aircraft, for example, and Procter & Gamble Co. uses it for new versions of its Pampers disposable diapers. Dassault’s Passion for Innovation Institute uses the company’s software to better understand the engineering triumphs of earlier eras. For example, the institute has worked with Boston’s Museum of Fine Arts to simulate the construction of the Great Pyramid of Giza in Egypt. It has also built a virtual-reality version of Paris, showing the construction over time of such famous landmarks as Notre Dame cathedral, the Bastille, and the Louvre. Now Dassault has used old blueprints and photographs, as well as sonar scans of hundreds of sunken ships and other structures off the Normandy coast, to unveil the remarkable military technologies developed by Beckett’s father and other innovative thinkers. “We wanted to give a tribute to those engineers,” said Mehdi Tayoubi, director of the Dassault Institute. For the longtime narrator of “Nova,” Peter Thomas, the D-day episode is like no other. “They called and asked me to do it, and it was a great honor for me,” said Thomas, a World War II veteran who went ashore at Normandy on the day after the opening assault. For centuries, nations have used ships to land invading armies on their enemies’ shores, but the Normandy landing was by far the largest such attack ever mounted. On June 6, 1944, about 160,000 American, British, and Canadian soldiers went ashore at Normandy, transported and supported by a fleet of 5,000 ships and 13,000 aircraft. The few Normandy landing craft that remain have undergone major alterations. “You don’t have a 100 percent original Higgins boat,” Tayoubi said. So his team digitally reconstructed them, using old blueprints, photographs, and the memories of people who sailed aboard them. The Dassault team used similar techniques to create a virtual version of the Waco glider, a flimsy unpowered plane designed to be towed behind a military aircraft. Dozens of Wacos glided deep into German-occupied territory in the predawn hours of June 6. They were packed with vehicles, antitank guns, and hundreds of airborne troops. But the troops on those gliders were vital to the invasion’s success. They seized key roads and bridges, preventing the Germans from sending reinforcements to the beaches. The biggest digitization project featured an obscure but crucial military innovation: two mobile harbors, codenamed “Mulberry.” They were constructed in secret, then towed to Normandy and assembled in the days after the invasion. Though the allies had not seized a French seaport, with these Mulberry harbors the could offload thousands of tons of supplies and quickly secure the Normandy beachhead. The Mulberries provided that crucial support. One of the two harbors, assigned to the American force, was destroyed in a storm two weeks after the invasion. But the second Mulberry, installed and operated by the British, survived the storm and lasted for months, until the allies could seize other ports nearby. Tayoubi said that Dassault will continue enhancing its simulations of World War II technologies. For example, it is impossible to fully appreciate the sophistication of a Mulberry harbor on a flat TV screen. So Dassault engineers plan to develop a simulation that will use the new Oculus Rift virtual reality headset. A viewer will be able to virtually stroll along the harbor and see a 360-degree view of the giant structure by turning his head.